, a global initiative dedicated to amplifying (and multiplying) the voices of YouTube creators who tackle division and hate with videos and stories of hope, connection, and understanding. And as 2016 comes to a close, we’re proud to say that YouTube Creators for Change is growing. What do cultural relevance, empowerment and mobile all have in common? Each is a prominent theme throughout the 2016 Year-End YouTube Ads Leaderboard - our annual look at the most watched and engaging ads of the year globally. Once again, advertisers delivered spots that took us on a rollercoaster of emotions, ranging from laughter to inspiration to “awwww...,” compelling viewers to both watch and share. As we reflect on this year’s list, we see ads like Mountain Dew’s #puppymonkeybaby that added to the cultural conversation (because who doesn’t love puppies, monkeys and babies?? ), while spots from Always and Pokemon evoked a “can-do” spirit. Mobile proved to be a key platform for viewers again this year. In fact, across the five Super Bowl ads on our Year-End Leaderboard, 81 percent of watch time came from mobile devices, with over 205 million combined mobile views. , you caught ‘em all, you took a moment to stand still, you layered … and layered … and layered. We think it’s fair to say, you crushed it. Now 2016 is coming to an end, and you know what that means … it’s time for #YouTubeRewind. Feel like a YouTube expert? Take our Rewind quiz to see how many trends and creators you can spot. It's also time to announce the top trending videos and music videos from 2016, according to time spent watching, sharing, commenting, liking and more. From Japanese comedy and European soccer to big celebrity moments and some of YouTube's most popular faces, this year’s top trending videos represent the amazing variety of creativity shared on YouTube every day. Collectively these 10 videos have 550 million views and were watched for over 25 million hours. The channels behind them collectively have more than 40 million subscribers who tune in regularly to watch the funny, insightful, entertaining things they create. In music, 2016 seemed to be all about "work," with Fifth Harmony landing the year's top music video (and more than a billion views) and Rihanna scoring the biggest audience in the first 24 hours for a YouTube music video in 2016. For even more end-of-the-year awesomeness, check out the YouTube Rewind channel. Kevin Allocca, Head of Culture & Trends, and the YouTube Rewind team, recently watched "Ultimate 2016 Rewind Challenge." 2016 was the year of the challenge. You did the running man, you caught ‘em all, you took a moment to stand still, you layered … and layered … and layered. We think it’s fair to say, you crushed it. And remember, today is Voter Registration Day and YouTube creators along with The Rock, Conan, Bill Maher, and The Chainsmokers want you to head to the polls and #voteIRL. Up next we’ll see you live from the vice presidential debate on Tuesday, October 4. Kurt Wilms, Product Lead, Live Streaming at YouTube, recently watched "Fastest Skateboarder Ever!" 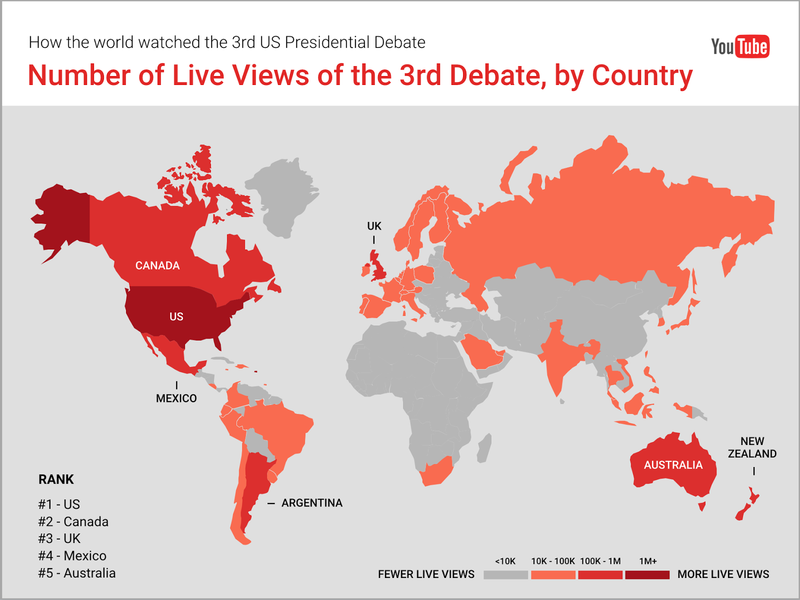 Last night's debate marked the largest political live stream of all time and was one of the biggest live streams in YouTube history. This record-breaking political stream garnered nearly 2 million live concurrent viewers and 3 million live watch hours across the six news organizations that streamed the debate on YouTube. To put these numbers into context, we took a look at 2012 debate viewership on YouTube. Compared to 2012, last night's debate had 14x larger live viewership, 5x higher watch time, and 4x more peak concurrent viewers. And views on all debate-related videos exceeded 88 million. so you could watch videos without suffering from buffering. A few months ago we rolled out Smart Offline, a feature that allows you to schedule videos to be saved offline later at off-peak times, when there’s more bandwidth so data is faster and cheaper. But we realized that for the next generation of YouTube users to fully discover all that YouTube has to offer, we had to reimagine the YouTube mobile app from the ground up. That’s why I and a team of engineers, designers, and researchers have been travelling to India, collecting ideas and testing prototypes with hundreds of people across 15 cities. They’ve helped us build a brand new YouTube app that’s faster, more relevant, and more affordable, with innovative new features. Meet YouTube Go: a new YouTube app built from scratch to bring YouTube to the next generation of viewers. 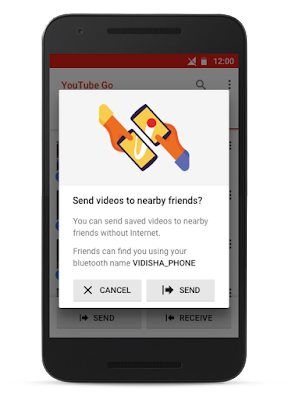 YouTube Go is designed with four concepts in mind. It’s relatable, with video recommendations and a user interface that is made for you. The app is designed to be offline first and work even when there’s low or no connectivity. It’s also cost-effective, providing transparency and reducing data usage. And finally, it’s a social experience, connecting you with the people and content you care about. The new preview function shows you what to expect before choosing to save or play the video, and in which resolution. You can also share videos to friends nearby, without using up any data. Find and discover relatable videos right on the home screen: YouTube Go homescreen features trending and popular videos in your area, so that you’ll find and fall in love with new videos that you and your community care about. Preview videos before you save or watch: Not sure if you want to watch the video? On YouTube Go when you tap on a thumbnail, it’ll trigger a quick preview of the video, giving you a better sense of what the video is about before you decide to save or play it. Choose your resolution when saving or streaming videos: Whether you’d like to save a video for offline viewing later, or stream it now, you can see and choose the amount of data you’d like to spend on that video. We’ll gradually roll out YouTube Go to more and more people over the next few months, getting their feedback and improving the product before launching it widely early next year. If you'd like to be among the first to find out when the app is ready, you can sign up at youtubego.com/signup. 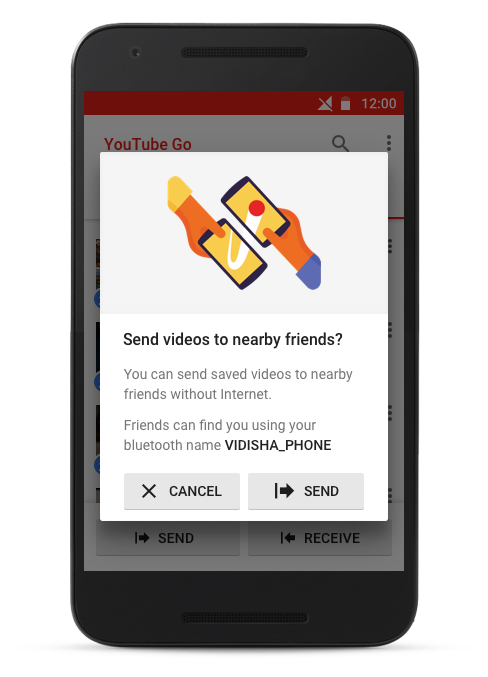 We’re thrilled to bring YouTube Go to India … ab Mazze udao, data nahin! Earlier this year, I had the chance to travel to India to see how people there were enjoying YouTube up close. While in Nagpur, I met a young man who loved using YouTube to watch WWE wrestling and wanted to show us his favorite video. But after he found it and tapped to play, the video just wouldn’t load. Maybe it was his phone or his 2G connection, but it just wouldn’t work. Unfortunately, this story isn’t an exception for our Indian viewers. They love YouTube and its amazing selection of Bollywood hits, comedy vlogs, cricket matches and—yes—even wrestling. But even as they discover the joys of YouTube, their experience is not great on slower connections and less powerful mobile phones. We’ve always believed that connectivity should not be a barrier to watching YouTube. In 2014 we launched YouTube Offline so you could watch videos without suffering from buffering. A few months ago we rolled out Smart Offline, a feature that allows you to schedule videos to be saved offline later at off-peak times, when there’s more bandwidth so data is faster and cheaper. But we realized that for the next generation of YouTube users to fully discover all that YouTube has to offer, we had to reimagine the YouTube mobile app from the ground up. they believe violates our Community Guidelines and we often hear questions about what happens to a video after you’ve flagged it. When a flag is received, the reported content is always reviewed by YouTube before being removed. We have internal teams from around the world who carefully evaluate reports 24 hours a day, seven days a week, 365 days a year, and these teams remove content that violates our policies or are careful to leave content up if it hasn’t crossed the line. Back in 2012, we noticed that certain people were particularly active in reporting Community Guidelines violations with an extraordinarily high rate of accuracy. From this insight, the Trusted Flagger program was born to provide more robust tools for people or organizations who are particularly interested in and effective at notifying us of content that violates our Community Guidelines. As part of this program, Trusted Flaggers receive access to a tool that allows for reporting multiple videos at the same time. Once content is flagged, our trained teams review them to determine whether to remove the flagged videos or not. Our Trusted Flaggers’ results around flagging content that violates our Community Guidelines speak for themselves: their reports are accurate over 90% of the time. This is three times more accurate than the average flagger. Given the success of the Trusted Flagger program, we want to do more to empower the people who contribute to YouTube in other ways. 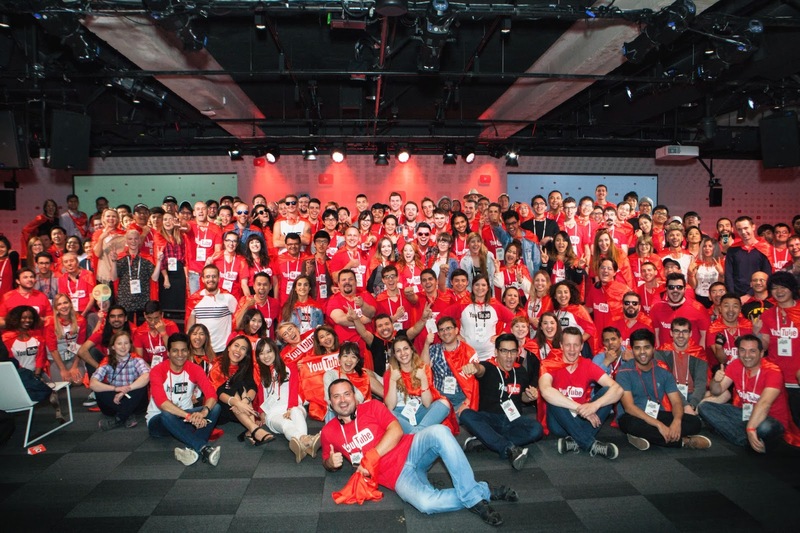 That’s why we’re introducing YouTube Heroes, a program designed to recognize and support the global community of people who consistently help make YouTube a better experience for everyone. These “Heroes” do this in big and small ways by adding captions & subtitles to videos, reporting videos that violate our community guidelines, or sharing their knowledge with others in our help forums. The program is now available to a select group of contributors from across the globe who have histories of high quality community contributions. People who are interested in joining the program can express interest here and we will gradually admit other top contributors into the program. YouTube Heroes will have access to a dedicated YouTube Heroes community site that is separate from the main YouTube site, where participants can learn from one another. Through the program, participants will be able to earn points and unlock rewards to help them reach the next level. For example, Level 2 Heroes get access to training through exclusive workshops and Hero hangouts, while Level 3 Heroes who have demonstrated their proficiency will be able to flag multiple videos at a time (something Trusted Flaggers can already do) and help moderate content strictly within the YouTube Heroes Community site. 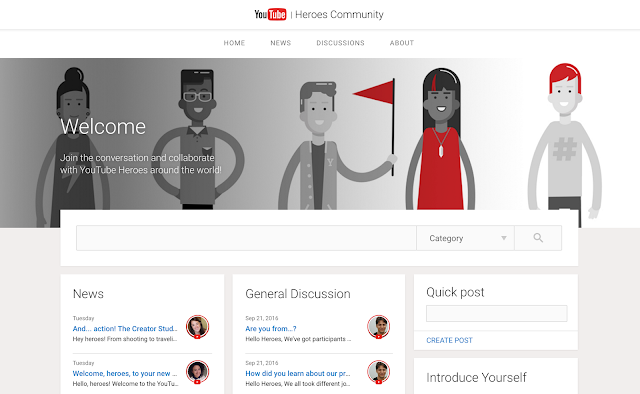 YouTube Heroes will also be able to track their own contributions and see their overall impact. They can easily find out when a video they reported has been removed by YouTube for violation of our policies, a subtitle they contributed has been approved by the creator, or a help forum answer they’ve posted has been marked as best answer. To kick the program off, we brought our first class of YouTube Heroes together for the first time this week at a two-day summit at YouTube HQ. Meet our first class of YouTube Heroes! It’s early days for the program and we will continue to roll out the details of YouTube Heroes and the dedicated YouTube Heroes Community site over the coming months. We’re excited to learn through this initial launch and to continue improving the program over time, as we’ve done with our Trusted Flagger program. We appreciate everything our community does to make YouTube vibrant and diverse, so on behalf of the team: thank you! YouTube has always allowed people to report content they believe violates our Community Guidelines and we often hear questions about what happens to a video after you’ve flagged it. When a flag is received, the reported content is always reviewed by YouTube before being removed. We have internal teams from around the world who carefully evaluate reports 24 hours a day, seven days a week, 365 days a year, and these teams remove content that violates our policies or are careful to leave content up if it hasn’t crossed the line. Minecon, an annual event dedicated to all things Minecraft, is happening on September 24 and 25 in Anaheim, Calif. For Minecrafters who can't attend, we are bringing Minecon to you by launching a Minecon 2016 event page on YouTube Gaming. You’ll be able to keep up with videos from your favorite creators and the latest Minecon announcements as they are happening. Minecraft gamers have been incorporating 360-degree video and VR into their content, and one of my favorite examples of this is the “Wonder Quest” series, which just released a new episode called "Spot the Differences.” Fans can expect more VR in upcoming episodes with a rollercoaster ride through highlights from season two, a 360-degree look into Stampy’s dreams, a scary Halloween-themed tale and much more. We are also excited to announce support for 360-degree live streaming of Minecraft videos, which will come from the developer CrushedPixel. CrushedPixel first blew our minds with his Replay Mod, which allows you to record Minecraft videos in 360 degrees. His new upcoming mod will take it a step further with the capability to live stream Minecraft videos in 360 degrees! CrushedPixel will be joining YouTube creator and star StacyPlays on stage at Minecon for a special 360 panel to discuss both her Bookcraft series as well as his work with the 360 mods. Together, we've built a new virtual world and a strong and open community on YouTube. We're excited to celebrate Minecon with you this year. Posted by Ryan Wyatt, Global Head of Gaming Content, recently watched "Wonder Quest 360 Video - Spot the Difference" with my nephew. I grew up watching Saturday morning cartoons like "Teenage Mutant Ninja Turtles" and "Transformers." Now when I spend time with my nephew and niece, we watch Minecraft videos, the new version of Saturday morning cartoons. Minecraft can be both educational and entertaining to people of all ages — players create their own worlds whenever and wherever they want. Minecraft is a huge phenomenon on YouTube with rich content, an engaged community and 130M+ videos. (Australia), Abdel en Vrai (Belgium), Nilam Farooq (Germany), Omar Hussein (Saudi Arabia), Barış Özcan (Turkey), and Humza Arshad (United Kingdom). Over the next year, program ambassadors will drive greater awareness of social issues and foster productive dialogue around these topics through the videos they create. They’ll also help identify and empower emerging creators who also want to speak out on these crucial topics. To support and amplify ambassadors and emerging creators alike, we are committing $1M in equipment and production grants as part of the Creators for Change program. We’ll also welcome these creators at new programs at YouTube Spaces throughout the year, so stay tuned for more details soon. Our efforts don’t stop here — we’ll also continue working with NGOs, schools, and media companies around the world to launch more local programs as part of Creators for Change. We recently introduced a program in France that brought together more than 700 participants who created 140 videos under the theme of fraternité. In Germany, YouTube creators joined forces under #NichtEgal, a movement dedicated to unite Germans in countering online hate. We’re also pleased to announce that Google.org, our philanthropic arm, is establishing a $2M charitable fund to support nonprofits working on innovative solutions that promote inclusion and cross-cultural understanding. We hope these new programs and resources will continue making YouTube a place where anyone can have a voice and where anyone can use the power of video to help generate positive social change. Juniper Downs, Head of YouTube Public Policy, recently watched "Web Rangers - ORT Sajur 2016." Video affects us like no other medium. It can heighten our passions, stoke our fears, awaken us to new experiences and make our hearts ache. It can educate, build understanding and even change the way we see our world. In fact, over half of our millennial subscribers have said a YouTube creator has changed their life. At a time when the internet is criticized for fueling division and distrust, we want to help demonstrate the incredible power YouTube has to generate a positive social impact. That’s why today, we’re introducing a new global program called YouTube Creators for Change, as well as new resources and grants dedicated to social change work. YouTube Creators for Change is a new initiative dedicated to amplifying the voices of role models who are tackling difficult social issues with their channels. From combating hate speech, to countering xenophobia and extremism, to simply making the case for greater tolerance and empathy toward others, these creators are helping generate positive social change with their global fan bases. Our first six Creators for Change ambassadors are Natalie Tran (Australia), Abdel en Vrai (Belgium), Nilam Farooq (Germany), Omar Hussein (Saudi Arabia), Barış Özcan (Turkey), and Humza Arshad (United Kingdom). of candidate and issues-related content on YouTube. But while people are clearly engaged with the election online, we want to make sure they get involved “in real life,” too. Today, we’re announcing YouTube’s get out the vote campaign, #voteIRL, where together with the YouTube creator community, we’re helping get young people to the polls. Check out our new #voteIRL anthem video featuring some of YouTube’s top talent, including Bethany Mota, Hannah Hart, Kingsley, Hank Green and more. Did you know it only takes 1:34 to register to vote?1 With voter registration deadlines looming in October, it’s fast and easy to register to vote using registration tools built by Google. Starting today, look out for familiar faces making 1:34 videos where they do anything from hosting their radio show (hey Ryan Seacrest) to doing their eyebrows, while encouraging their fans to go register. We teamed up with AwesomenessTV, Fullscreen, Machinima, and Maker Studios, so watch for more 1:34 videos every day until National Voter Registration Day. In addition to the link above, you can also find voter registration tools directly on YouTube. Watch out for registration reminders on the homepage, watch page, and search results page on September 27, Voter Registration Day. Voting requires you to get educated with the latest and greatest from the candidates. That’s why we’re excited to announce that we’re live streaming the presidential debates from more news organizations than ever before including NBC News, PBS, Fox News, The Washington Post, Univision, and Telemundo. You can also follow your favorite YouTube creators, including The Young Turks and Complex News, who will be on the ground reporting from the debates using YouTube Live directly from their phones. Stay tuned to youtube.com/youtube and our social media channels as we release new videos, report from the presidential debates, and bring you closer to the election (and the polls) this November. And make sure you’re registered to vote! Claire Stapleton, YouTube Elections team, recently watched "Maymo the Dog Runs for President: Maymo 2016." 1 We got a group at YouTube together and registered in every state and the average was just 1:34. At YouTube, we believe in giving everyone a voice. So this U.S. elections season, we’re committed to making sure that people--especially young people--use their voice by voting. With November just around the corner, election-related content is exploding. Over 200,000 election videos have been uploaded to YouTube every day since the July Conventions and you’ve watched more than 110 million hours of candidate and issues-related content on YouTube. This Wednesday, President Juncker will deliver his State of the Union address at the European Parliament. The next morning, the European Commission — along with partners Debating Europe and Euronews — will turn to YouTube to field questions about the issues that matter most to people across Europe. YouTube Creators Jonas Ems, Laetitia Birbes, and Łukasz Jakóbiak will travel to Brussels from their homes in Germany, France and Poland to meet with President Juncker at the Commission’s headquarters at the Berlaymont. While Euronews has hosted live Hangouts on Air with European Commissioners in the past, this is the first time that YouTube Creators will have the opportunity to conduct a full interview with the President. Nineteen-year-old Jonas is already a veteran YouTuber — not only has he built up a large following for his commentaries and comedy, he’s also published a book about his experiences. Laetitia focuses on sharing her values, like ecology and recycling, and she recently participated in YouTube’s Toi-Même Tu Filmes initiative, aimed at fighting hate speech. Łukasz, who conducts interviews from his tiny Warsaw apartment, explained in an inspirational TedX talk last year how he went from dreamer to doer (and how he got to meet Lady Gaga along the way). It’s up to Laetitia, Jonas, and Łukasz to choose the questions: They’ll focus on the issues that are top of mind for them and their fans. If you want to weigh in, they’ll be looking at suggestions on social media with the hashtag #AskJuncker. You can watch the whole thing on the European Commission YouTube channel — the live stream will begin at 11 am CET, and the recording will be available afterward.